"On the weekend of the 5th and 6th July 55 competitors took to the water at Marconi Sailing Club for the annual East Coast Piers Race in aid of The Cirdan Trust and Essex Air Ambulance. 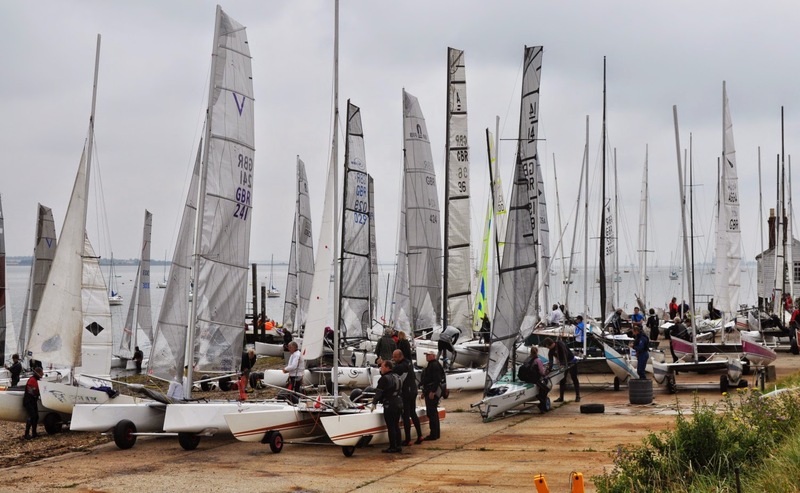 The event sponsored by sailing clothing company Zhik, sees sailors from across the country take part in a long distance race from the club, out of the Blackwater Estuary and along the Essex coastline. 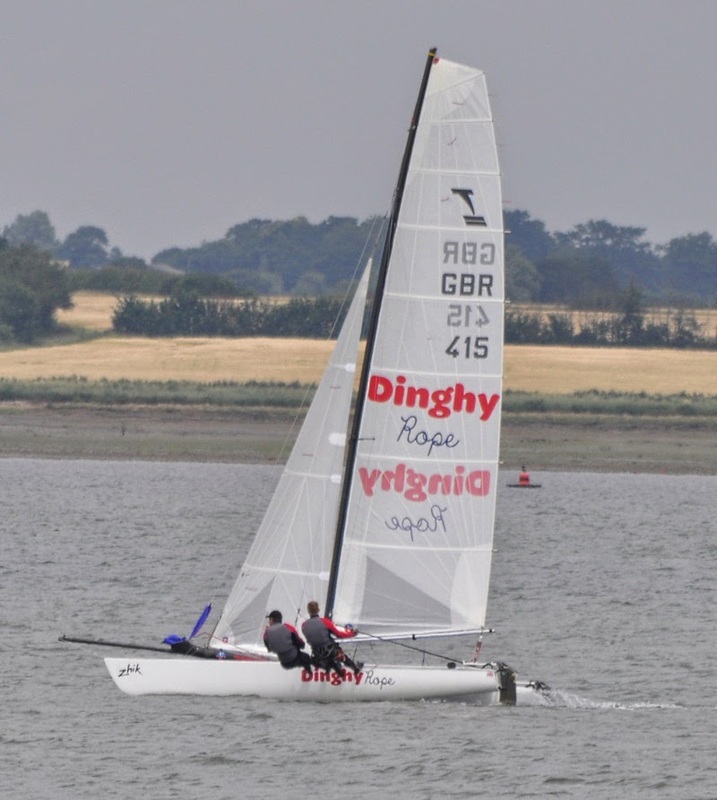 Two consecutive races are held, the Piers Race which requires catamarans to sail as far as Walton on the Naze and the Colne Point race which goes half the distance. On Saturday two races were held in gusty conditions, both races took competitors up and down the Blackwater Estuary which turned into an upwind/downwind course. Jenny and David Ball sailing their Spitfire took the first race victory with a clean start ahead of the others. In the second race Pete Jary and Oli Egan won sailing their Tornado in what was described as perfect Tornado sailing conditions. It was however the consistent team of Philip Marks and Oliver Northrop who took overall victory on Saturday with two second place results. Sunday morning arrived with the competitors awoken by the loud speaker system and the sound of Neil Diamond, a request we get every year from a certain Datchet sailor. The racing began at 9am in light winds which were building as the ECPR fleet moved out of the river using the tide to take them along. The ECPR fleet didn’t realise the wind behind them had faded and the Colne Point boats were struggling to move with their start 20 minutes after. Seeing a shortened course flag at Clacton was a surprise for the leading boats until they returned back towards the Colne Point fleet seeing a wall of parked boats and a lack of wind. Luckily for the leaders, they were not left long before the breeze filled in taking the leaders even further in front. For the Colne Point racers, the breeze dropped off for everybody on the way to Bradwell with the majority of the boats drifting with the ebbing tide. This allowed the boats at the back to catch the leaders up. With the wind starting to build for the return back this left everyone with a long beat back into the Blackwater Estuary and up to Marconi Sailing Club where the finish line was located. Tornado’s took the line honours in both races with Kevin Dowley and Tom Brooks tackling the shorter Colne Point race of 27 miles and Mitchell Glynn and Andrew Dowley taking on what turned out to be a 38 mile race. Marconi members Mitchell Glynn and Andrew Dowley managed to build a big enough lead to take the victory in the East Coast Piers Race, only the second time in the club’s history that its own sailors have taken the top spot. The Colne Point Race for catamarans was won by Sprint 15 sailor Mark Bunyan from Stewartby. The Colne Point dinghy race was won by Marconi members Mike Taylor and Nick Pavitt sailing an Osprey. Thank you to our event sponsors Zhik, Adnams, AM Safety Specialists, Dinghy Rope, Yachts and Yachting and Funky Monkey Boat Names. We also couldn’t organise the event without the help of the support teams, both members and non members of Marconi Sailing Club. The date for next year's race is Sunday 15th July 2015.